Luckily I stumbled upon the Royal Indian Curry House in Poblacion, we were still quite unsure whether to try it but the servers outside ushered us in encouraging us to give it a chance. The moment we stepped inside we could already smell the fragrant spices of Indian Cuisine. I was quite surprised with the interior, it had a nice ambiance, very clean, vibrant, lovely velvet sofas, ambient lighting and these beautifully carved wooden pillars that were on the sides of the room. There were a lot of guests at this time considering it was 10 pm during a weekday. 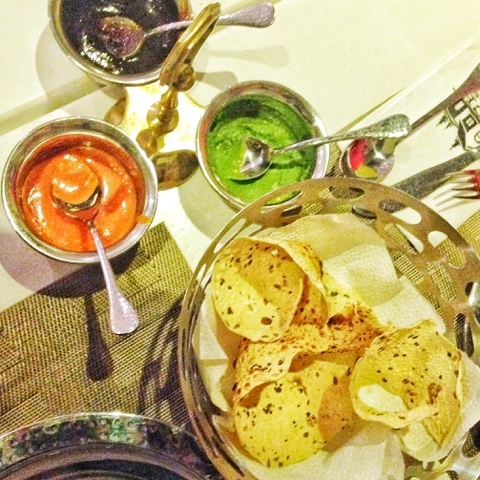 When we were first seated, they served us this thin crisp Indian bread that the servers called /pa-per/ with sesame seeds and these 3 sauces, namely: Chili, Green Chutney( I think this has a lot of silantro), and tamarind paste. To be frank, all I could think about at this point, were the Samosas that would go perfectly with these sauces. They also used the classic stainless steel plates I usually see used in Indian movies, making it a good balance of casual and high end. For appetizers we had the Vegetable Samosas, and it was quite huge for only 119 pesos an order. Mild flavors of cardamon, cumin and coriander come to mind with the right crunch. Downside is it’s a bit oily. Try it with the Green chutney sauce. Next up is the Butter chicken. If cant handle spicy then this dish is for you. It’s creamy, full bodied, a bit sweet and tasty. 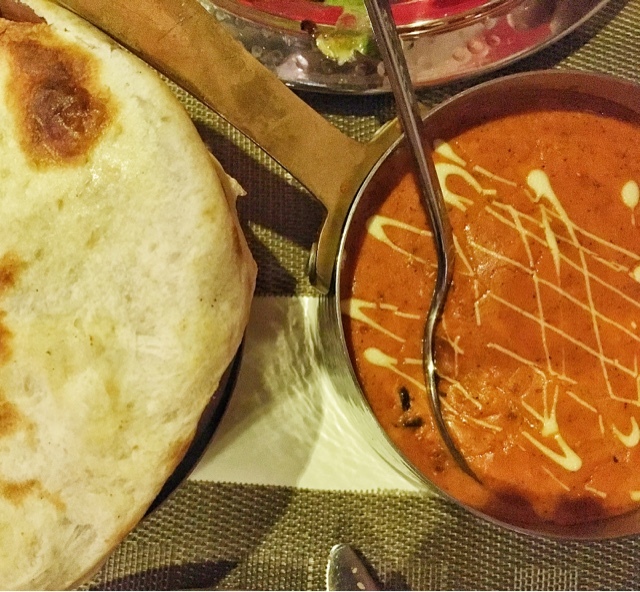 Everything butter chicken is supposed to be. I remember when I used to live in Canada, my uncle who was a chef would make tons of this and stock it up in our refrigerator. It brings me back when I would fill up a bowl with piping hot rice and this chicken. Not bad for 349 pesos per order. Now, for the best biryani I’ve had, the Hyberabadi Biryani. They serve it in a clay pot covered with pita. 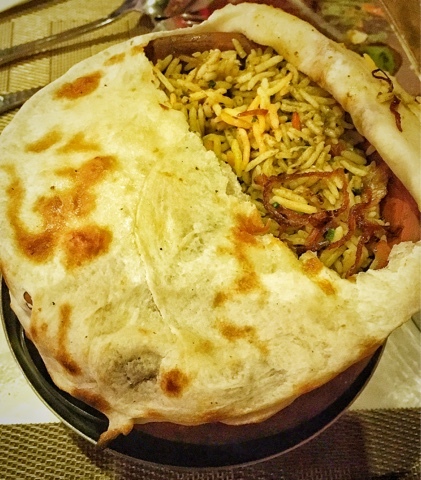 This envelops the aroma of the steaming hot basmati rice, spices, and lamb umami. Imagine the tender succulent lamb that sits on the bed of rice, as it cooks, its slowly coated with the lamb juices. The lamb chunks are like little diamonds in the bed of rice. To say I loved this dish is an understatement, it goes perfectly with the raita. The Raita is a indian condiment made of indian yogurt, cucumber and silantro. For 499 pesos, this dish can serve 1-2. It’s a MUST TRY! 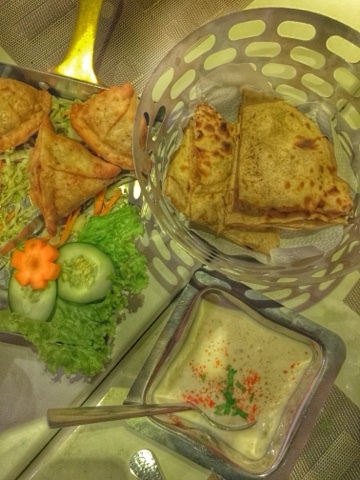 The Royal Indian Curry House, is a must try restaurant especially when you are craving for authentic Indian food. The bursting feeling of satisfaction with every mouthful seared into my memory. Any little thing you are thinking about, stays afloat as you enjoy bite after bite of this hearty meal.